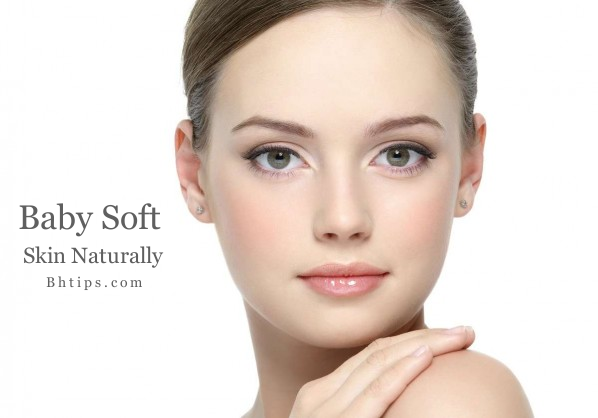 It is an instinctive desire of everyone woman to have a baby soft skin. Unfortunately, accumulation of dirt, dust, pollution, lack of skin cleansing, improper skin care, harmful effects of UV Sun rays and harsh environmental conditions may steal away the natural skin moisture and leave behind dull rough and scaly skin. Beauty conscious women usually spend a lot of money on buying expensive commercial products including various creams and lotions but often don't get the desired results. However, if you really want a baby soft skin then simply go with natural home remedies which are less expensive and with almost zero side effects. Let's have a look on some best natural tips to get baby soft skin even at home. Massage your skin with Virgin Coconut Oil. Virgin coconut not only moisturizes and protects your skin from major types of breakouts but also help a lot to get baby soft skin.Try to massage coconut oil on your skin 3 to 4 days in a week. If you massage your skin with virgin coconut oil mixed with vitamin E, it can control aging of your skin. Papaya fruit contains vitamin A, carotenes, Vitamin C and other phyto-nutrients that are known to fight against skin damaging free radicals and helps to slow down aging process. Apply a paste of ripe papaya on your face or on your body. Leave it for 10 to15 minutes. Then wash this with water. It will make your skin fresh and Baby Soft. To get baby soft skin, mash some bananas and add some milk to form a paste, apply this paste on your face and leave it on for 20 minutes and then rinse it off. For best results repeat this at least twice a week. Apply a paste of apricot and honey on your skin. Leave it for 15-20 minutes. Then Wash the pack with water. The pack helps in absorbing excess oil from your skin, reduces wrinkles, and make your skin feel fresh, soft and smooth just like babies. Take a carrot, grate and mix it well with one spoon of honey. Apply this all over the face and leave it for only 15 minutes. Finally wash with fresh water.You may use this every week on regularly basis. This can use by all skin types and makes your skin soft and smooth. Mix one spoon of honey with the white of an egg and grated potato. Mix them well to make a smooth paste and apply this on the face and let it dry. After 20-30 minutes wash it off with cold water this will give you fresh and smooth baby soft skin. For baby soft and smooth skin you can also apply a mixture of honey and rosewater over face and neck. It also acts as one of best homemade bleach. After 15 minutes rinse off with fresh water. A mixture of strawberry and sour cream is also very helpful to get baby soft skin. Mash one strawberry and mix with sour cream and apply the mixture on your clean face and neck. After 30 minutes remove it with fresh water.This will also leave a baby soft and fresh skin. Facial Mask with Banana, honey and yogurt is also very effective for nourishment and moisturizing of dry skin. For this one you will need two bananas, one tablespoon of honey and half a cup of yogurt. Put all ingredients in a blender and mix until becomes homogeneous.Apply the mixture on the skin and wait for 20 minutes, until it dries. Remove it with warm water. Yogurt not only hydrate and soften your dry skin, it will also exfoliate your skin, removing dead skin cells. Exfoliate your skin once every week or at least once every fortnight. Exfoliation removes dead cells from your body and make your skin soft and smooth. for skin exfoliation you can make a simple sugar and lemon scrub or sugar and olive oil scrub and gently rub your skin with this scrub to remove dead skin cells. Eat fatty fishes like salmon, mackerel and sardines at least one or two times per week. Salmon is an important source of Omega-3 fatty acid. It keeps your skin soft and youthful. Legumes and leafy vegetables are important sources of vitamin E. Vitamin E helps slowing down the aging of skin by producing less collagenase and makes your skin look younger and baby soft. Drinking 8-10 glasses of water everyday helps flushing out toxins and other harmful chemicals from your body. It also helps you to have smooth and fresh skin. Adopt a habit of regular exercise because it not only helps you to tone your muscles but also prevent your skin from sagging. Exercise also improve blood circulation and improved skin condition too. It makes your skin soft and flawless. (i)First of all before applying any facial mask or pack clean your face and neck with fresh water. (ii)Remove all cosmetics, creams, lotions even everything. For this purpose use a non abrasive and good quality beauty soap. By using this soap, wash your skin with warm water to open skin pores and pat your skin dry. (iii)Before applying any facial mask or pack first take a Patch Test on little area of your skin and wait for 10 to 15 minutes if it creates itching or allergic effect then immediately remove it from skin and avoid this mask. (iv) Don't leave a facial mask or pack on any longer than instructed. After recommended time period immediately remove it from your face.